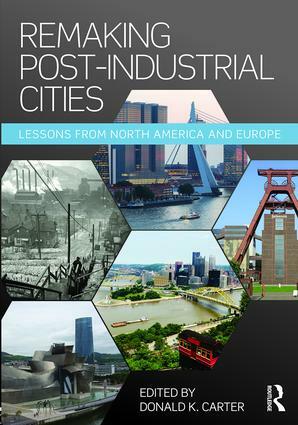 Remaking Post-Industrial Cities: Lessons from North America and Europe examines the transformation of post-industrial cities after the precipitous collapse of big industry in the 1980s on both sides of the Atlantic, presenting a holistic approach to restoring post-industrial cities. Developed from the influential 2013 Remaking Cities Congress, conference chair Donald K. Carter brings together ten in-depth case studies of cities across North America and Europe, documenting their recovery from 1985 to 2015. Each chapter discusses the history of the city, its transformation, and prospects for the future. The cases cross-cut these themes with issues crucial to the resilience of post-industrial cities including sustainability; doing more with less; public engagement; and equity (social, economic and environmental), the most important issue cities face today and for the foreseeable future. This book provides essential "lessons learned" from the mistakes and successes of these cities, and is an invaluable resource for practitioners and students of planning, urban design, urban redevelopment, economic development and public and social policy. "Remaking Post-Industrial Cities is a must have, must read for all of us that are fascinated by the past, present and future of our urban environments and their capacity to shape the lives of their citizens and the future of civilisation." –John Thompson, Honorary President, The Academy of Urbanism. Donald K. Carter is Director of the Remaking Cities Institute, Carnegie Mellon University (CMU) in Pittsburgh. He is also Track Chair of the Master of Urban Design program in the School of Architecture. Prior to joining CMU in 2009, Don was President of Pittsburgh-based Urban Design Associates. He is a Fellow of the American Institute of Architects and a Fellow of the American Institute of Certified Planners. He was Co-Chair of the international 2013 Remaking Cities Congress. Don earned a Bachelor of Architecture from CMU and did post-graduate studies in urban design and regional planning at the University of Edinburgh, Scotland.